Dragon fruit are gaining in popularity. I recently found one in the grocery store and had never seen one before. I HAD to buy it and do a little research on it, then test it out myself. So, I’m sharing that with you. Below are video links where I share basic information about dragon fruit and also how to cut one. I also have another blog post where I did a complete review of the fruit itself. My 101-video notes are below the video links. I hope this helps!! Dragon fruit grows on the Hylocereus cactus, also known as the Honolulu queen, whose flowers only open at night. It is the fruit of a climbing cactus, so it’s related to prickly pears. The plant is native to southern Mexico and Central America, but now it is grown all over the world. It has different names, including pitaya, pitahaya and strawberry pear. The two most common types have bright red skin with green scales. The most common type has white pulp with black seeds. Another less common type has red pulp and black seeds. The red pulp variety is a bit sweeter than the white pulp fruit. There is also a yellow dragon fruit that has yellow skin and white pulp with black seeds. Its flavor has been described as a slightly sweet cross between a kiwi and a pear. Dragon fruit is a good source of fiber, magnesium, and other nutrients as well. The red flesh variety has a little higher nutritional value with added carotene, which helps in eye health and immune function. It is considered to be a low-calorie fruit with about 60 calories in a 3.5 ounce serving. It does contain some antioxidants that are known to help protect fatty acids from free radical damage. Dragon fruit’s fiber and antioxidants have been shown to reduce insulin resistance and fatty liver disease. Its prebiotic fiber has been shown to help promote healthful gut bacteria. These properties make dragon fruit helpful in treating diabetes, heart disease, digestive issues, and even preventing some cancers. In rare cases, people have had allergic reactions to dragon fruit. So, if you’ve never had it before, try a small amount at first, just to be sure. Signs of an allergic reaction include tingling or itchy feeling in the mouth, hives, swelling of the lips or tongue, nausea or vomiting. Select a ripe fruit with bright, evenly colored skin, that gives a little when squeezed. A very firm dragon fruit will ripen up on the counter after a few days. Freeze-dried pitaya powder is also available commercially. Dragon fruit can be stored on the counter for a few days. 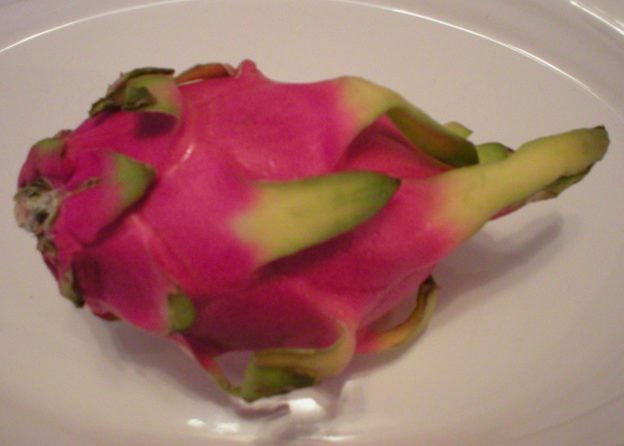 Store ripe dragon fruit in a plastic bag in the refrigerator. Once cut, it should be stored in a tightly sealed container in the refrigerator. It will keep this way for only a day or so. If it begins to turn brown or gets mushy, it’s time to discard it. With a sharp knife, cut it in half lengthwise. The pulp can be spooned out or the peel can be removed with a knife and the fruit cut into desired size pieces. The skin of the dragon fruit is not edible, although some people will use the skin of half of a dragon fruit as a little serving dish for the inside flesh of the fruit. Dragon fruit is eaten raw. It can be cut up and eaten as it is, or cut into bite-size pieces and topped with yogurt and nuts, or added to a salad. It is also used in salsas, smoothies, drinks, sorbets, and mixed into sauces served on fish. Dragon fruit would be excellent in a fruit salad mixture including pineapple, kiwi, blueberries, and/or strawberries. Topping that with yogurt would be delicious! Dragon fruit pairs perfectly with fish dishes, particularly cod, tuna, and mahi-mahi. Serve the fruit whole on the side or drizzle your dish with a sauce or chunky salsa. Also dragon fruit goes well with lemon, mango, strawberry, milk, yogurt, chia seeds, pancakes. This entry was posted in Food and tagged about dragon fruit, dragon fruit 101, dragon fruit flavor, dragon fruit taste, recipes dragon fruit, what to do with dragon fruit on April 10, 2019 by Judi.